This struck a chord with me, because I think about it all the time. But at that point, many around the world will probably choose not to listen. They’ll realize that the United States is capable of electing someone like Trump to the nation’s highest office, and there’s no guarantee that Americans won’t make a similar decision again in the future. People around the globe will have no way of knowing when the electorate might elect someone else of Trump’s ilk. And with that lack of confidence comes consequences. When Trump’s successors, for example, try to reach international agreements, and make promises to our partners about the United States honoring its commitments, foreign officials will know that a Trump-like figure might come along, take office, and decide to betray those commitments. America will struggle to lead because Trump will have left a stain on our global standing that will be difficult to remove. We’ll want to regain the trust we had earned from much of the world, but how long that might take is unclear. What Scriber thinks about “all the time” is the question: To whom will foreign officials turn to in a post-Trump era of uncertainty about America? One answer is China. Read on. Making China Great Again. New Yorker staff writer Evan Osnos writes a stunning, comprehensive essay about the shifting balance of global influence. 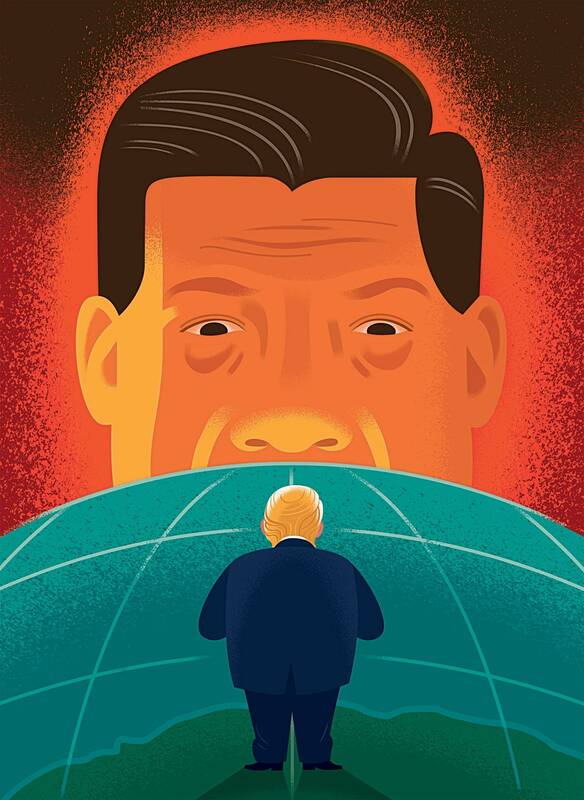 “As Donald Trump surrenders America’s global commitments, Xi Jinping is learning to pick up the pieces.” I might add, yearning to pick up the pieces would be a better way to describe China’s ascendancy. For years, China’s leaders predicted that a time would come—perhaps midway through this century—when it could project its own values abroad. In the age of “America First,” that time has come far sooner than expected. China’s approach is more ambitious. In recent years, it has taken steps to accrue national power on a scale that no country has attempted since the Cold War, by increasing its investments in the types of assets that established American authority in the previous century: foreign aid, overseas security, foreign influence, and the most advanced new technologies, such as artificial intelligence. It has become one of the leading contributors to the U.N.’s budget and to its peacekeeping force, and it has joined talks to address global problems such as terrorism, piracy, and nuclear proliferation. And China has embarked on history’s most expensive foreign infrastructure plan. Under the Belt and Road Initiative, it is building bridges, railways, and ports in Asia, Africa, and beyond. If the initiative’s cost reaches a trillion dollars, as predicted, it will be more than seven times that of the Marshall Plan, which the U.S. launched in 1947, spending a hundred and thirty billion, in today’s dollars, on rebuilding postwar Europe. … for decades, China has relied on protectionism—but Trump provided an irresistible opening. China is negotiating with at least sixteen countries to form the Regional Comprehensive Economic Partnership, a free-trade zone that excludes the United States, which it proposed in 2012 as a response to the T.P.P. If the deal is signed next year, as projected, it will create the world’s largest trade bloc, by population. By some measures, the U.S. will remain dominant for years to come. It has at least twelve aircraft carriers. China has two. The U.S. has collective defense treaties with more than fifty countries. China has one, with North Korea. Moreover, China’s economic path is complicated by heavy debts, bloated state-owned enterprises, rising inequality, and slowing growth. The workers who once powered China’s boom are graying. China’s air, water, and soil are disastrously polluted. And yet the gap has narrowed. In 2000, the U.S. accounted for thirty-one per cent of the global economy, and China accounted for four per cent. Today, the U.S.’s share is twenty-four per cent and China’s fifteen per cent. If its economy surpasses America’s in size, as experts predict, it will be the first time in more than a century that the world’s largest economy belongs to a non-democratic country. At that point, China will play a larger role in shaping, or thwarting, values such as competitive elections, freedom of expression, and an open Internet. Already, the world has less confidence in America than we might guess. Last year, the Pew Research Center asked people in thirty-seven countries which leader would do the right thing when it came to world affairs. They chose Xi Jinping over Donald Trump, twenty-eight per cent to twenty-two per cent. China’s leaders rarely air their views about an American President, but well-connected scholars—the ranking instituteniks of Beijing and Shanghai and Guangzhou—can map the contours of their assessments. Yan Xuetong is the dean of Tsinghua University’s Institute of Modern International Relations. … Before I could ask a question, he said, “I think Trump is America’s Gorbachev.” In China, Mikhail Gorbachev is known as the leader who led an empire to collapse. “The United States will suffer,” he warned. … Yan said that America’s strength must be measured partly by its ability to persuade: “American leadership has already dramatically declined in the past ten months. In 1991, when Bush, Sr., launched the war against Iraq, it got thirty-four countries to join the war effort. This time, if Trump launched a war against anyone, I doubt he would get support from even five countries. Even the U.S. Congress is trying to block his ability to start a nuclear war against North Korea.” For Chinese leaders, Yan said, “Trump is the biggest strategic opportunity.” I asked Yan how long he thought the opportunity would last. “As long as Trump stays in power,” he replied. And as long as Trump stays in power the Chinese will continue to play him. Even without the psychiatric assessments of his narcissism, the Chinese understand him far better than the average American voter. [During Trump’s November trip to China] Xi deftly flattered his guest. Upon Trump’s arrival, they took a sunset tour of the Forbidden City. They drank tea, watched an opera performance at the Pavilion of Pleasant Sounds, and admired an antique gold urn. The next morning, at the Great Hall of the People, Trump was greeted by an even more lavish ceremony, with Chinese military bands, the firing of cannons, and throngs of schoolchildren, who waved colored pompoms and yelled, in Chinese, “Uncle Trump!” Government censors struck down critical comments about Trump on social media. Before Trump took office, the Chinese government was far outspending the U.S. in the development of the types of artificial intelligence with benefits for espionage and security. According to In-Q-Tel, an investment arm of the United States intelligence community, the U.S. government spent an estimated $1.2 billion on unclassified A.I. programs in 2016. The Chinese government, in its current five-year plan, has committed a hundred and fifty billion dollars to A.I. Set aside couple of hours to read and digest the rest of Osnos’ article. And then spread the word. Trump and his reflexive acts have made us weaker, not stronger. Made us less, not more, secure. Made us poorer, not richer. Made the world a more, not less, dangerous place. So, as our democracy slides into idiocracy, Trump’s beligerence and bullsh!t accelerates China’s ascendance as the next global leader. I have this nagging feeling that America will never be great again. Can the GOP put Trump on notice?